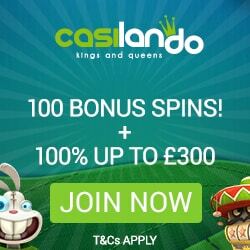 There is a brand new online casino on the horizon – Casilando, arriving with a complete setup that features all manner of gambling derivatives and betting variations. This will be a great opportunity for a lot of players to check out some of the latest gaming releases, plus get an instant bonus upon arrival as well as the mandatory free spins to use on many slots. Along with a colorful background and the animated interface, the website offers access to multiple options that will keep you on the edge of your seat for quite some time. The best part about all this is that you can always win actual money; real cash that can add to staggering numbers upon scoring a jackpot. It is a true place for kings and queens, but do not be mistaken – everybody is welcome to join Casilando casino, to have as much fun as only possible. If there is one thing that quickly piques the interest of Casilando viewers upon reaching the home page, then it would be games for sure. The most notorious titles were delivered straight from the NetEnt studio, so meeting a lot of slots can be expected at this point. Those are not the only genre that casino Casilando is known for, as categories like Jackpots, Live, Blackjack, Roulette, Table, Poker, Scratch, Bingo and Virtual, have also their place there. Some of the notable video slots by Net Entertainment include: Arabian Nights, Fantasini: Master of Mystery, Dragon Island, Thief, Fisticuffs, Evolution, Zombies, Fruit Case, Fruit Shop, Hook’s Heroes, Egyptian Heroes, Mythic Maiden, Magic Portals, Diamond Dogs, Secret Code, Glow, Simsalabim, Nrvna: The Nxt Xperience, Super Lucky Frog, Football: Champions Cup and more. Whether you plan to gamble with your own funds or simply for fun, there is always a great deal of options to choose from.